To get a HEX-code in your Attiny85 it is possible to use the Arduino as a programmer, but as you cannot load hexcode in your IDE, it involves using avrdude. First of all, we need to get the Attiny85 clocked to 8Mhz. Open up your Arduino software and upload the ArduinoISP sketch to your board. Connect your Arduino board in again and choose these settings. Just to clarify, you are not burning a bootloader here. You are resetting the fuses in the Attiny to clock it at 8Mhz. We do that by using the arduino as a programmer. You should still still have the ArduinoISP sketch loaded on your Arduino. Make sure your Attiny is still attached to your Arduino as described here and open a command prompt. (In your windows start menu type cmd or chose the terminal in Linux/Ubuntu). This will bring up a list of options explaining what everything does. Only need a few of those commands. -p t85… This is the avrdude code for Attiny85. -b 9600… This is the baud rate (Use what is specified in the sketch loaded onto your Arduino.) . -U flash:w:example_attiny85.hex:i This tells avrdude you want to write the firmware (example_attiny85.hex) to flash memory (flash). The ‘i’ is at the end to tell avrdude what format it is writing in. Avrdude should now read your chip, write to your chip, then read your chip. If all goes well, you should get: avrdude done. Also check here: Programming an Attiny with an Arduino Nano. When programming the ATtiny85 with 8Mhz you say to Make sure your firmware is in the right place . Could you tell me what is the correct firmware and what is the correct place to put it. The correct firmware is the program you want to put in the chip. The option in ” Tools – Board – Attiny85 @ 8Mhz” will be available when the arduino will be programmed as ISP? Cause now that nothing is plugged in I can see only Arduino type devices available on the menu “Boards”. Hi there! Great post, it led me in the right direction, albeit I had to do some tweaking. The last avrdude command did not work due to an out of sync error. If found this thread: http://forum.arduino.cc/index.php/topic,111853.0.html where it says that you have to change the baud rate from 9600 to 19200, which solved my problem. Just wanted to point it out, maybe my case is special. Thanks again. Thanks for your input. It may help some people! Hi, Is it possible to set fuses for the attiny also? How would we do that? It is certainly possible to do that, but I am not sure if yu can use the arduino to program those, at least I never tried that, you would need a programmer working with AVRdude or stk500. “avrdude -c avrisp -p t85 -P comX -b 9600 -U lfuse:w:0×62:m -U hfuse:w:0xdf:m -U efuse:w:0xff:m –U flash:w:example_attiny85.hex:i”. I hope someone give me an answer. Yes i know that, but how? I don’t understand yr problem maybe. You ask me how to ignore something? Well, by ignoring it. Or do you mean that it won’t program because of that error? Are you sure it didnt program? Do you have the latest version of AVR dude? Its working!I just restarted my computer and it works. Great! would it be just as simple to only read the code from an already programmed attiny (4313-pu)? Maybe you can steer me in the right direction. Hope it’s kind of on topic still. but it gives me a bunch of error messages: ” stk500_getsync() attempt 1 of 10: not in sync: resp=0x00 ” etc. And those leed me nowhere. i’m using an arduino duemilanove(ATmega328). maybe it is because the protection fuse is set on the attiny. or just a communication problem. (i do see a blinking led on the arduino). Will give it another try.. and probably best to bring it to another forum… maybe get a olimex avrisp! Could it also have something to do with the 120ohm resistor i put between reset and vcc? maybe the attiny4314 is set to 8 MHz.. hmm. Do i need to connect a cap and resistor on the duemilanove? Will try the 0.1 uF capacitor between VCC and GND and 10 Kohm resistor between RESET and VCC. I forgot what value I used for the resistor, but the caps I used were 10 uF. So you can try the 10k+0.1uF as you describe, but also try the 10uF alone between reset and ground. I am sure you have read this blog: http://blog.oscarliang.net/program-attiny2313-using-arduino/ telling you to use a 120 Ohm resistor instead of the 10uF. the connections you made seem OK, but just make sure the wires connect. Are you using a breadboard? I have had many occasions where i got the not in sync error and several times it was through a wrong connection, eventhough I checked several times. The fact that the Attiny is 8Mhz should not make a difference. That is only important for the program you are going to run on it. I tried about everything at this point, 120 ohms, 10k+0.1uF and 10uf, i also read people had some succes with this error by removing the capacitor. did that but without luck. Also got a nano clone from banggood but same error. I think i tried about everything ;), I tried different programmer names in the avrdude command line that gave some other errors. (that let me nowhere). also tried to read the fuses but i got the same error! anyways, i searched the web and could not find anyone that successfully burned this chip with the arduino, 2313 no problem tho. So i gave up, thanks again for your suggestions. I need an avrisp anyways so will go that route and see where it leeds me! Actually I found 1 or 2 who made it. Apparently someone succeeded with the 022 IDE, using the 2313 settings, altered to match the 4313, but I agree, many people have problems with it. As we seem to be in the same country and yr 4313 seems to not be doing anything soon, would you care to spend say 69 cts in postage and let me have a go? Will send it back to you, failed or succeeded. Send me the program that you want in there too, of course, only if you feel like it. But he doesn’t seems to write the software after reading the fuses right? Intact when I try to use the chip seems not programmed! That is odd. At first glance it seems you have done everything right. Are you sure the chip is not programmed? could it be that your program is faulty and just doesnt do anything? 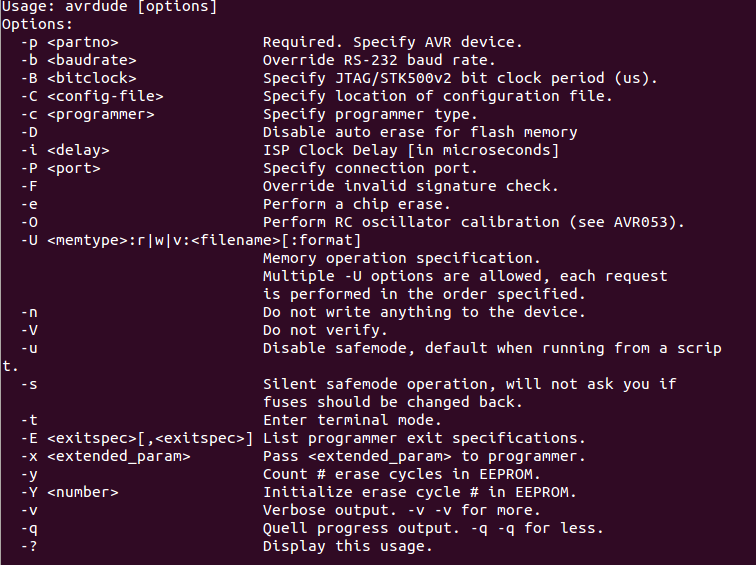 ‘avrdude’ is not recognized as an internel or externalcommand, operable program or batch file. No it is not. A makefile is a simple text file that organizes the code you want to compile.